Seeing the response to this blog convinced me they’re right even if they’re biased. Carole, Kamey, Megan, Piper, Julie… make a note. It took the response to a blog, hosted on the Naval Surface Force, U.S. Pacific Fleet’s site, to finally convince me. Here it is, syndicated by Huffington Post. I didn’t write the story for public consumption. I wrote the facts down so a good friend of mine who works at the Pentagon could tell Navy senior leadership how awesome the men and women of the USS Dewey are. In all of the hustle and bustle following the visit, and Bud’s death and funeral, I forgot to send the ship a thank you card. I always send thank you cards. When I sat down to write out the “Five Ws” I had about an hour to get it done. This story was actually a PDF with a few photos embedded. I labeled it Dewey AAR (after action report) and sent it out hoping the Sailors would hear back from someone in their chain of command and know how much we appreciated their time and commitment to an old man they’d never previously met. I’m not going to write any more about the visit here. I can’t say it better than I did, don’t feel the need to correct the grammar or rearrange any of the details. I didn’t write it for accolades. Just a simple, albeit verbose, attempt at making sure a group of amazing Sailors knew I appreciated their time and effort. Imagine my surprise when the PDF made it’s way from the Pentagon back to San Diego. Mandy called and asked if I had seen the email circulating with the PDF. When Kai, the Social Media Manager for SURFPAC, called and asked if they could share it on their blog for Veterans Day, I was hesitant. I agreed simply because I wanted the Sailors of the USS Dewey to have a chance to see their long overdue Thank You. I’ve long harbored a grandidea of online anonymity; none of my public facing social media platforms include my real name, I’m careful about details, conservative with my “likes” and comments on FB. When she asked for a brief bio of mine to include on the bottom of the post it’s fair to say I freaked out a little bit. I almost changed my mind about letting her share it. I’m glad I didn’t. This story isn’t about me. It’s amazing to read some of the comments people’ve left on the various sites. (my friends are sending them to me; I haven’t mustered up toe courage to read the comments) I had no idea so many people would read it and share it and be touched by it. It’s humbling to have my friends send me notes and say they saw the story on this page or that page. And so there you have it. I’m not a blogger, really. I’m just someone who lets her thoughts escape through her fingertips from time to time in an attempt to make friends laugh, enjoy an experience I’ve had and apparently, cry. Maybe I’ll learn how to hyperlink and categorize and upload video. Maybe. They told me this morning the story has had more than 100,000 views. I hope that means the Sailors of the Dewey heard my (late) thank you. Wow it’s November 2016 and I just read your AAR (as you called it). You should know it came to me through a Navy Mom’s Facebook page (my daughter joined the Navy a year ago). Although your written account was long ago, you still make some of us cry and others feel pride in our US Navy. I will read this to my hubby tonight (retired from the Marine Reserves) and another human will be touched by your story of Budaboard the Dewey. He too would tell you S/F. I read your article through Confessions of a Funeral Director, with tears in my eyes. Stories like this always touch my heart. My husband was in the Marines for 12 1/2 years, so we GREATLY appreciate everything that every service member does for our country. These sailors showed the true spirit of the service in every way possible. May God bless each and every one of them. Thanks for your note. I agree, the Sailors of the USS Dewey are incredible. Please tell your husband I said thanks for his service and Semper Fi. Former FMF Corpsman here and proud / moved to witness your brilliant, selfless work. You just “get it”. Please continue sharing your powerful talent. Thanks, Doc. I appreciate the note. And thanks for your service. the son of a sailor and brother of a sailor navy blue runs through and through. ms haskamp your story reads beautifully, very clear concise, very well written. bud was very lucky to have you in his life, not many a child or grandchild would bother to make a dying sailors wish come true. your effort and determination and the work of the crew of the Dewey shows why we have the finest Navy in the world. I hope you know your story has touched the lives of many people. Its funny at the end of your story the blog reports that you are still trying to figure out what to do when you grow up……. my dear you are wise beyond your years. I thank you from the bottom of my heart for sharing your story with me. Dear Bud Rest In Peace… red skies at night….. may you always have a fair wind and a following sea. It is almost Christmas, the tree is up (yes, real) and gift shopping is done (online as I am not a very patient shopper). The last week I have spent most of my time trying to be an anonymous “boy scout”. I wont say what or how, but I am doing them, as the opportunities present themselves. That’s what my mom and dad taught me. Those were the values of their generation. My dad was a WWII Navy Radio Operator in a Grumman Avenger torpedo plane, and as my mom tells me, saw action in every major battle in the Pacific. He even showed me a picture of the Marines hoisting our flag on Iwo Jima that he took from out the window of his TBM -the real one not the staged one. I was real young then, Said those boys stuck it up there quick like and then got right down cause they were under heavy fire – and it was his “job” in the Avenger to help fix that for them. Your story not only told me of the “awesomeness” of the current crew of the Dewey, but reminded me of all those men and women of the WWII generation, and the values that they represent. I am in awe of every single one of them, no matter what they did. I wish my dad could have seen the memorial to the WWI vets in Washington. I think he would have liked it. Thank you so much, Jennie, and keep it up! Love the blog. Gotta run, the airport is an hour away – the USO will be there for those soldiers coming home to (and through) Cleveland. What a story Jenn! Emotional through and through. Makes me proud to say I, too, served in Dewey (DDG-45). I am happy to hear your father was so well received on the day of his wish! Thank you for sharing! I love any Military story and your story about Pearl Harbor reminded me about my parents and in-laws who went through WWII and all the stories they told me as we grew up around them. My father died before he ever knew he became a Veteran in WWII as he became a Merchant Marine due to a sheep’s bone being grafted in his left hand. Merchant Marines officially became Veterans in 1989 and he died 1976. He would have been a Marine, given his choice at the time!! He did give his all to the Merchant Marines. My Uncle left school to be in the Army despite his parents dismay. Coming forward, I had many friends & relatives in the Services for the Vietnam “war” & all the Sand wars now! I have many friends in the Marines and in AF and Navy!! Freedom is not Free and your writing reminds everyone that we have fought for this freedom with wonderful people like your Dad Bud and my Father and yourself and many others especially our friends. And, there are not enough days in one year to remember them our Veterans and Current Military keeping us Free!!! Semper Fi!! Jennie, I loved the story. I’m glad you published it. It brought tears to my eyes and lump in my throat. Thank you. Words fail me. Thanks for Bud’s story. Thank you for this exceptionally well written account of a truly heartwarming and inspirational story. EM2 Cloud reminded me of so many of the WWII servicemen I encountered during my career as a Navy hospital corpsman and healthcare administrator. They seemed to express special pride in their ships and units. My father-in-law was in the 15th AAF and flew in B-24’s as waist gunner and radio operator. He was extremely proud of the B-24 and had a large print of a B-24 in flight over his desk, along with as his record of combat flights over Italy, Yugoslavia, Romania, & Germany. 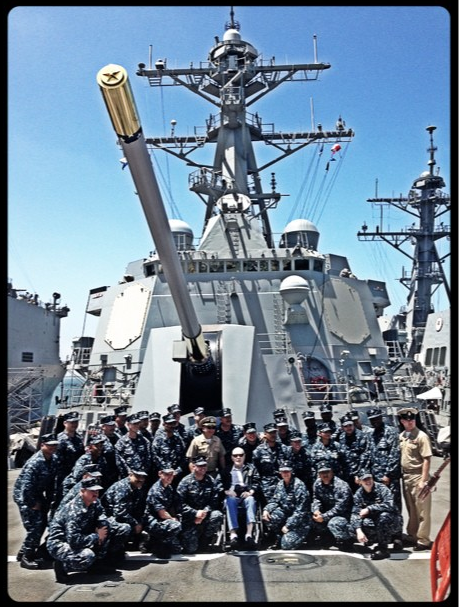 The officers and crew of the USS Dewey conducted themselves well indeed. My very good friend and neighbor, Jack Aldis, was an electrician’s mate on the Dewey DD – 349 at Pearl Harbor. I imagine he and Bud were friends. Jack was very proud of the Dewey and shared many of her adventures with me. He was an active racing sailor in the Sunfish class into his eighties and he received permission from the International Sunfish Class Association to renumber and race his boat as 349 in her honor. Jennie, you did a wonderful job on the story about Bod Cloud’s visit to the Dewey and your “Belated Thank You, …” story. Congratulations. Jennie, this story touched me deeply. Thank you for sharing, My dad is a US Navy Vet, having served 22 years. He doesn’t do electronic media, so I told him about this story. He really enjoyed this story. He wished you would share it in the Navy Times; as a I said, he is old school and still reads print media. Thank you for sharing your story about your father. This should have been the Person of the Week story on NBC News. Here is to Bud and all his new friends. Stay strong and keep writing. Buds story was just shared on Facebook by a Seabee buddy of mine (https://www.facebook.com/photo.php?fbid=10152026061029769&set=a.360794549768.147593.182249954768&type=1), and I read it at the side of the road in the cab of a dump truck. I was in tears. Bud got the absolute best send off any former sailor or Marine could have ever dreamed of. Thanks Master Chief Grgetich and fellow swabbies for piping ashore one of the few Pearl survivors left. Hoorah, Marine, for submitting the story. Thanks for your service, Sailor, and sorry about the tears. Hi Jennie, I’m an editor with The Huffington Post’s Good News section in NYC. We love the blog post you wrote, and we wanted to know if you’d be up for having it featured on our page. Please email at megan.griffo@huffingtonpost.com if you’re interested — we hope you are! Jennie, i just received your article through my close friend, a retired Navy SEAL captain, who forwarded it to me.b We were both moved. i am retired Surface Warfare commander, a writer and currently work for Pacific Tugboat Service in San Diego. i also write two weekly columns for my home town newspaper back in Lebanon, TN, and just recently published a poetry book. i would like to condense your article for one of my columns in The Lebanon Democrat, giving you full credit. I loved your story and what you did for bud. I wish I could have met Bud. I’m looking forward to going back and reading you previous blog posts. What a nice story! It brought tears to my eyes! My father was a navy radioman third class in the Pacific during WWII. Sometimes he was stationed at Johnson Island. He was a character fer sure. Never left the Navy behind. Insisted we kids take navy showers! Taught me Morse code! “Dad, nobody uses morse code anymore!” He died in 2001. To this day I make my bed with military corners! LOL! It’s wonderful what you did for this man! god bless you! Military corners… you’re more dedicated than I am, Lynn. Thanks for the comment. You know, if you’re still versed in Morse Code I bet there’s a museum nearby that’d enjoy you giving talks and examples! Jenniie, the story of Bud visiting the Dewey is still making its rounds. I just received it from a Cruiser Sailor friend My husband who was a WWII Vet serving on both the USS Augusta and USS Biloxi. from 1940 – 1946. My husband is nearing Bud’s time, and he thought it was great you helped Bud get his wish. Thank you for your comment. Please tell your husband I said thanks for serving and for paving the way for my generation of men and women to serve. THere’s a reason we call HIS generation the GREATEST generation. I will Jennie. Our thanks to you, my son and so many others for carrying on for our country. Followed a link on Facebook and read your blog about the trip to the Dewey with Bud. You’re like the heroes who, at the award of a medal, can be heard to say that the other guys (or gals) were the real hero in that situation. Modesty becomes you! When we die, I hope I can meet you in heaven. You will surely be there, and maybe the good Lord will take pity on an old sinner and let me in too. Keep up the good work, and the blogging, Jenn. You’re “a keeper”! Thanks for your comment. Funny you say it’s becoming; I mean it when I say the heroes of that day were the Sailors of the Dewey. I’ll see you on the other side. Thank you for this story. I’m glad you decided to publish it and I can tell from comments that many, many others appreciate it as well. I feel a bond with other vets, even though my service was only 7 years in the Army National Guard, insignificant in many ways. So, maybe I’m a softy, but I’m proud to have worn the uniform and proud of all the men and women who gave so much to our country. Thanks again.